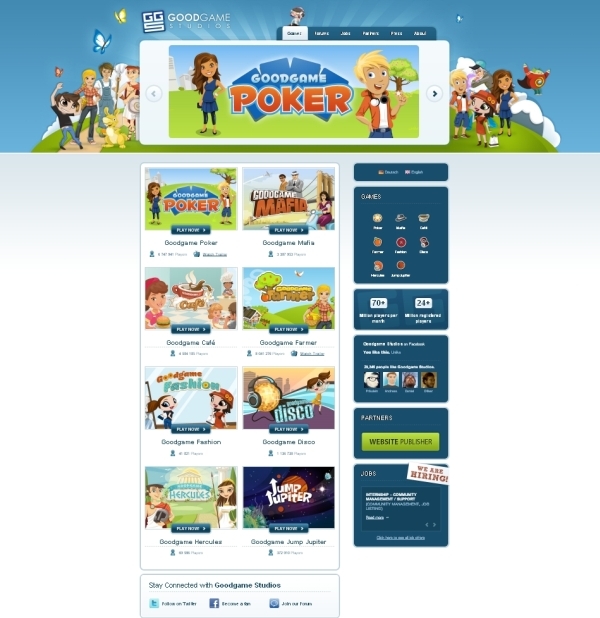 Goodgame Studios’ portfolio includes role playing games, such as Goodgame Mafia and Goodgame Hercules, management games (Goodgame Café, Goodgame Disco and Goodgame Fashion), the classic card game Goodgame Poker, an action game called Jump Jupiter as well as a simulation, Goodgame Farmer. All of the free of charge games are family-friendly. The website also provides tutorials for gaming beginners. In order to allow for more easy dialog with the provider, all communication channels have also seen remarkable improvements. As such, every game offers links, which provide the player with access to personalized support and the community’s many help forums, at various distinct points throughout. Another central focus in the restructuring of the company’s web presence has been to brake it down into a gaming portal and a corporate area, which has made the website more clearly laid out and informative. Behind the scenes looks allow for the customer to get to know the company as well as what an everyday workday at the successful game developer is like. Moreover, the direct link between the company’s website, its facebook and twitter channel allow for visitors to always stay informed about what’s happening at Goodgame Studios. Anyone, who would like to become part of the young and professional team, can choose from 30 job offerings and make direct contact with the company’s human resources department. HR manager, Hendrik Mainka, is looking forward to “the creative applications by many talented applicants as well as lost of exciting job interviews and great new colleagues”. The services being provided for the press, business partners and publishers have also been extended. Visual materials are being offered for download in a special area. Additionally, all press releases and articles about Goodgame Studios are being published. Anyone that wants to stay up to date can subscribe to the company’s press release mailing list and receive all news via e-mail.